One of the most enduring memories of childhood holidays to the alpine regions was that wild and relatively unpopulated area of forested, mist shrouded hills that we passed through on leaving the lowlands of France and before sighting the high peaks of the Alps. 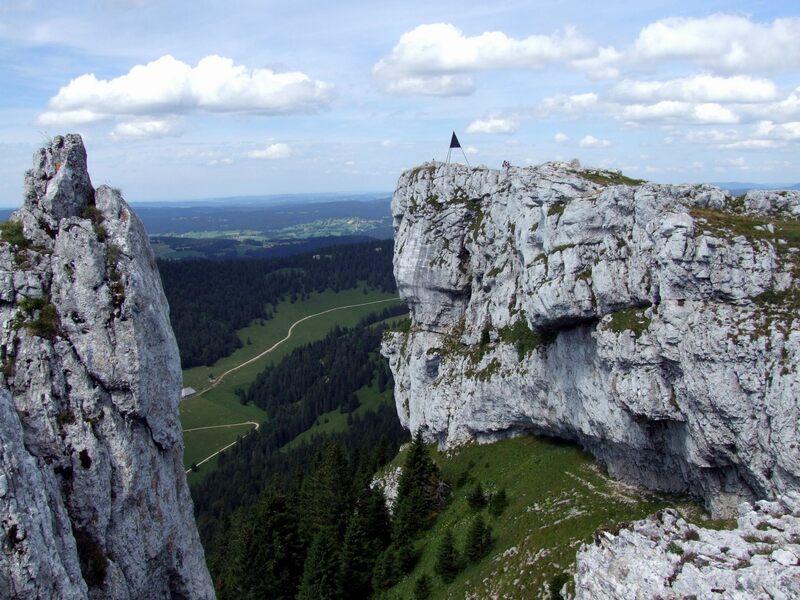 The Jura Mountains run along much of the Swiss frontier with eastern France and their unspoilt nature has changed little since those early visits. 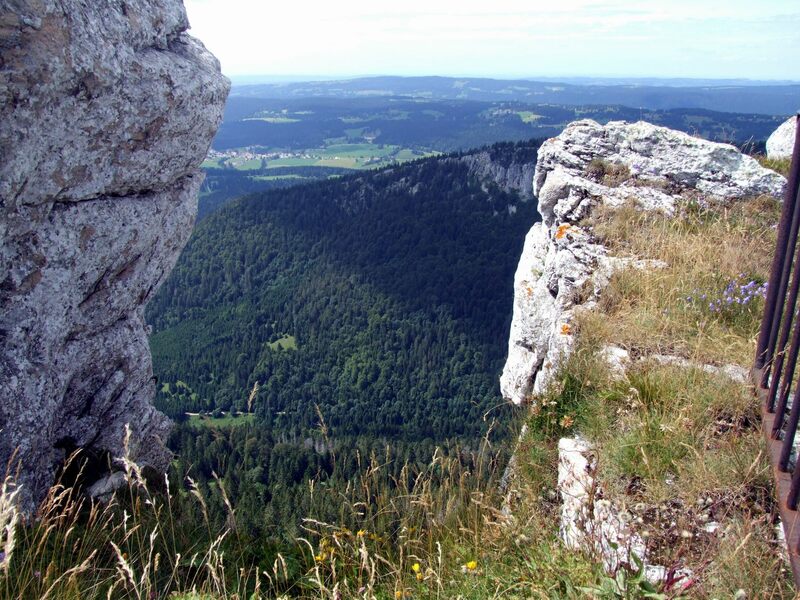 It is the largest area of forest in France and some of the valleys do indeed resemble those of the Alps further to the south though the mountains themselves are pastoral and pleasant rather than imposing for here are no 3000 metre peaks to challenge the hiker; indeed the 2000 metre contour plays no part on maps of the Jura. What the traveller will find however is a timeless country with family friendly mountains, tumbling rivers and beautiful lakes set in deep forest. In short nature as it was intended. 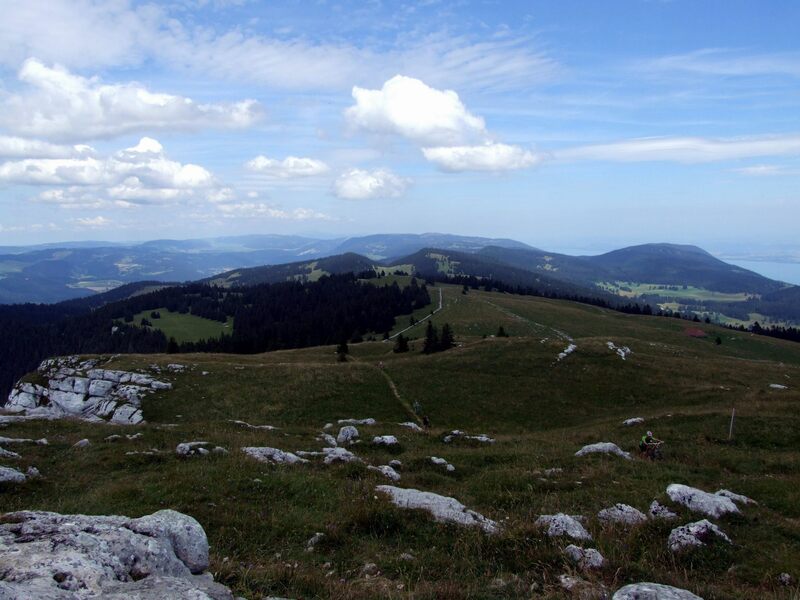 The highest of the Jura peaks is the Cret de la Neige (1718m) overlooking Geneva in the South while other notable summits include Chasseron, Chasseral and Mont Tendre though their names are little known outside of France or Switzerland. The closest to our base of Pontarlier was the Chasseron (1607m or 5273 ft) which rises above St Croix just over the border in Switzerland. So it was on one day in August, here that we headed for a mountain adventure complete with four year old Daniel and one year old Benjamin in his buggy. Following the minor road to Les Rasses and Hotel Chasseron from St Croix soon brought us to a left turn for the hotel which led up through forest to emerge in open meadows above. This is as far as you can drive unless you are a guest of the hotel to where a dirt road continues beyond the gate. This gave Benjamin’s buggy no problems and brought us to the hotel on the end of the summit ridge of the Chasseron. The views across Lac de Neuchatel towards the distant Alps are awesome though the shining snows of the Bernese Oberland appeared somewhat faded by the summer haze. Beyond the hotel, an easy path (though not for buggies) leads to the summit in five or ten minutes walk to reveal a sheer drop off that comes as a surprise after the easy terrain so far. Don’t let the kids run off ahead here! 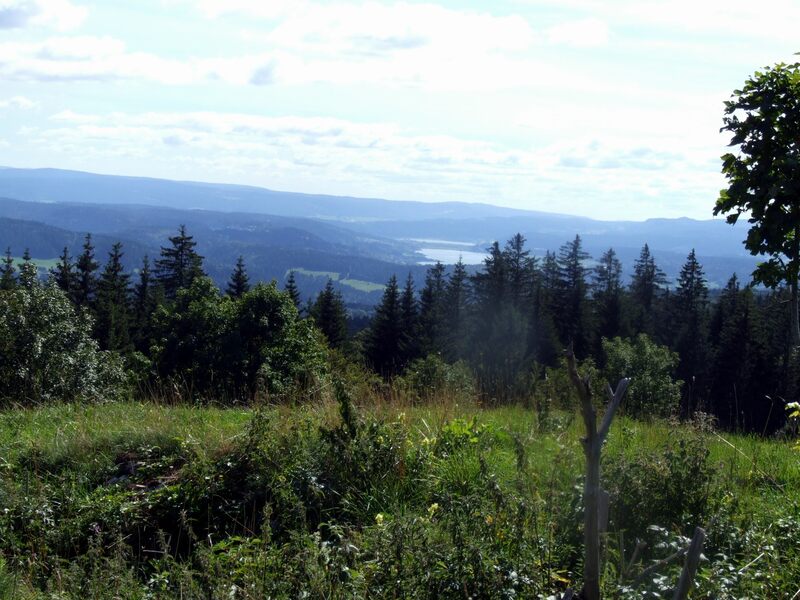 The view north towards France is across a beautiful green and forested valley towards Pontarlier and the plain beyond while all around are the verdant hills that typify the landscape of the Jura Mountains. This entry was posted in Switzerland, travel, Uncategorized and tagged Europe, France, holidays, landscapes, mountains, nature, outdoors, photography, random, Switzerland, travel, writing. Bookmark the permalink. Good to see another post from you, Pete. 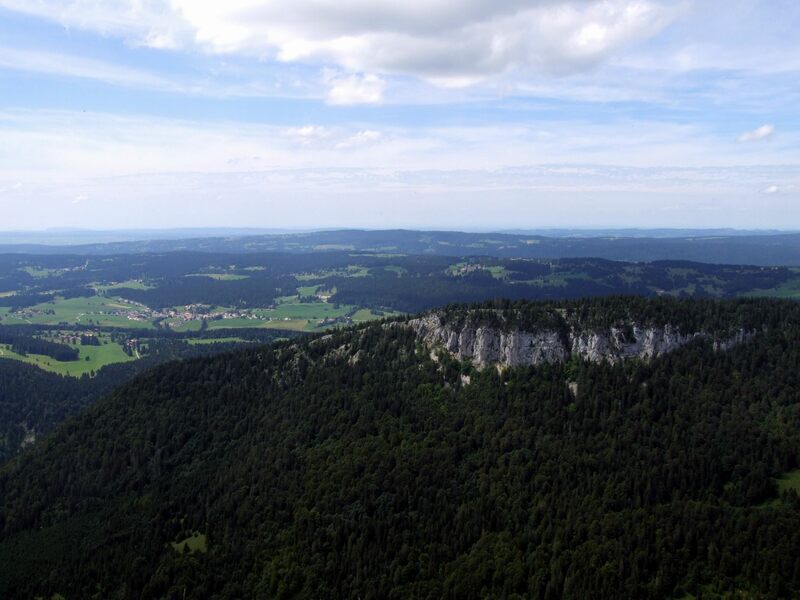 We have driven through the Jura countless time from Pontarlier over the top through Les Hopitaux-Neufs to pick up the Autoroute towards Lausanne on the way to the Rhone Valley. Never had an opportunity to stop, always pushing on. I’ve always enjoyed looking at the rolling country though. Hi how’s it going? I thought it was about time we had a bit of a look around the Jura as we always headed straight through too. There’s a nice campsite just past Pontarlier where we had a really good week. Thanks for the comment. I haven’t been to Switzerland, and to be honest, I thought I was kind of over Europe after coming home from my last trip. Not even close, your post made me realize. The mountains look gorgeous, the drop even more – I can almost imagine standing at the edge, looking at France. Looking forward to reading more from you, Pete! 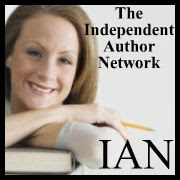 Thanks Shivya – I’m glad you enjoyed reading. To be honest this region was somewhere I’d passed through before but never really looked at. I enjoy your posts too!